Ms. Marwa Osman. PhD Candidate located in Beirut, Lebanon. University Lecturer at the Lebanese International University and Maaref University. Political writer/commentator on Middle East issues with many international and regional media outlets. Under the vigilant command of Saudi Arabia, the monarchs of Al Khalifa in Bahrain are on a new brutal crackdown spree on peaceful protesters, rendering citizens stateless and condemning them to death. 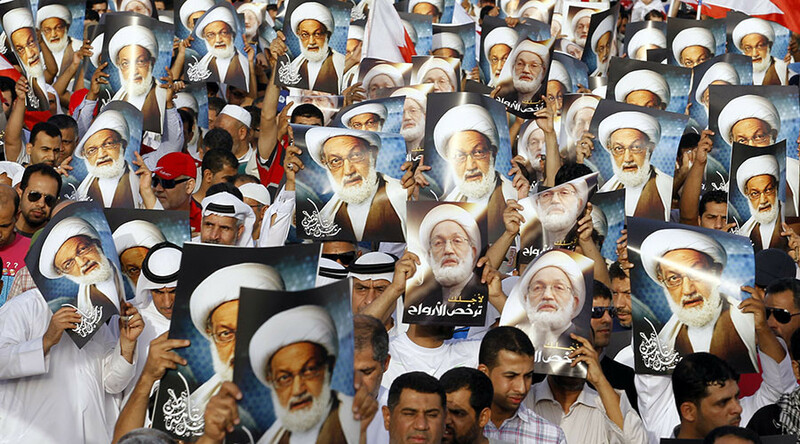 The Bahraini religious leader Sheikh Isa Qassim, who drafted Bahrain’s constitution in 1973, was this week given a one-year suspended sentence and a fine of one hundred thousand Bahraini dinars ($265,000). Khums (a Shia annual religious practice of donating money) funds and property used by religious sciences students of the Islamic Awareness Institution were also confiscated. Last June, Bahrain also stripped Sheikh Qassim of his citizenship, accusing him of using his position to promote violence. The decision left him stateless and at risk of deportation, prompting supporters to stage a sit-in outside his home. However, this sit-in turned into a war zone when on Tuesday, May 22, the Bahraini Interior Ministry announced a security operation had begun in Diraz to "maintain order and remove violations punishable under the law that hinder the movement of citizens." 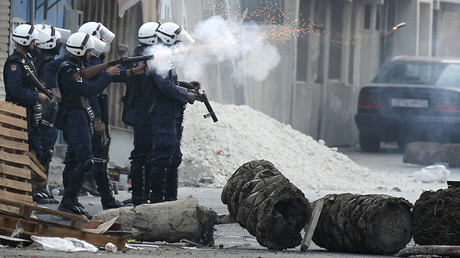 The raid which targeted the house of Sheikh Isa Qassim triggered clashes, with officers opening fire at demonstrators. Why is Bahrain crushing the sit-in? It all began in February 2011, when more than 200,000 Bahraini citizens set up camp at the Pearl Roundabout in the capital of Manama to call for fundamental government reform. Inspired by the Arab Spring uprisings in Egypt and Tunisia, Bahrainis from all walks of life withstood government raids and political arrests during their month-long occupation of the iconic site. As a result of the movement’s resilience and popular following, it appeared that change would come to Bahrain. However, in March 2011, the Saudi Arabian military rolled across the causeway to assist the Bahraini government in a brutal crackdown on peaceful dissent. These troops formed the core of the Peninsula Shield, the Gulf coalition force which King Hamad bin Isa al-Khalifa invited into Bahrain to turn the tide as his security forces lost control of the streets. So basically the Saudis would not allow any form of reform to take place in their Bahraini “backyard” in fear of it igniting similar demands inside the ruling territories of Al Saud. It did not take too long for the Saudi authorities to point at Iran, a long-time regional rival, and accuse it of having influence over the protesters, the majority of whom were Shia. This could not be farther from the truth. As was well documented by the Bahrain Independent Commission of Inquiry, which was established by King Hamad to investigate human rights abuses in 2011, Iran had no involvement in Bahrain’s uprising. In fact, the protest movement encompassed the sectarian divide, uniting Sunni and Shia citizens in their demand for reform and an end to authoritarian rule. The tiny Gulf island of Bahrain has been a focal point for the Saudi-Iranian rivalry; the crises its Sunni monarchy faces with its majority Shiite population offer an explicit glimpse into Saudi Arabia’s crave for control and bigotry. Saudi Arabia’s national security depends on maintaining the status quo, and this is what the Saudi Foreign Ministry emphasized on May 24 claiming security and stability of Bahrain is an integral part of the security and stability of Saudi Arabia and the Gulf Cooperation Council countries. An overthrow of the Al Khalifa family and the rise of what the Saudis see as a pro-Iranian or even a simply anti-Saudi Bahraini government would be catastrophic for Saudi Arabi’s national security and its hegemony among the Gulf States. It would lose confidence among allied states worried about growing “Iranian power.” By default, this means that Al Saud is afraid to see a system of governance for the people and by the people like the one in Iran for instance. Otherwise, why would a sit-in in front of a Sheikh’s house be of any threat or danger for the Bahraini monarchs? It is impossible to exaggerate the level of paranoia that exists in the minds of Sunni Arabs about the threat from Shia Islam and its homeland, Iran. Even the most well-educated and progressive of Gulf Arabs believe Tehran is organizing Bahrain's uprising and that the protesters are fifth columnists for a regime of ayatollahs. In Saudi Arabia the paranoia is comprehensive. With a sizable Shia population, mainly in the key oil-producing east, any assertion of Shia rights is embroidered into an insurgency. The Shiite question is the significant non-security aspect of the Saudi-Iranian rivalry; it is an ideological matter with security-related consequences. Saudi Arabia’s Shiite minority population is around ten percent. Shiites form a local majority in the oil-rich Eastern Province, through which about ten percent of the world’s oil is produced daily. Beginning with the Shiite uprising in the town of Qatif in the Eastern Province in 1979, the Saudi ruling family has been wary of Iranian influence among its Shia minority in the Eastern Province who have close ties with the Bahraini Shia majority, though many are cautious toward and do not identify with Persian Iran. The perception of Iranian influence among Shia remains. Shia groups first gathered up in the early 1970s following Bahrain’s declaration of independence into the IFLB “The Islamic Front for the Liberation of Bahrain” and in the mid-1970s, aimed to overthrow the Al Khalifa family and establish an independent Bahraini state. The group was behind the infamous 1981 failed coup attempt and proclaimed its allegiance to Ayatollah Khomeini, which brought about much of the fallout with Iran. It is highly important to note that it was not Iranian meddling that brought about the coup attempt in Bahrain. The IFLB had received support from Shia in the north in Diraz and Aali. With 73 people on trial for the coup attempt, the regime had to be careful not to stimulate outrage among the Shia majority, yet went ahead and suppressed demonstrations surrounding the trials. Associating Bahrain’s protests with the so-called Iranian interventionist plans in the Arabian Peninsula is a very smart move by Al Saud and Al Khalifa since it provokes sympathy of the “global powers,” particularly the US and UK, to help Manama leaders to provide legal covers for their attempts to curb waves of pro-reform demonstrations. The US primary approach in response to the Bahraini people’s protests was to bolster the Al Khalifa regime with weapons and international support, lest we forgot, Bahrain is also home to the US Fifth Naval Fleet. Therefore, efforts to inflame the consecutive US administrations against Iran’s regional role and influence expansion can urge Washington to intervene in Bahrain’s crisis. Meanwhile, British arms sales to Bahrain have increased significantly over the past six years, while in the background abuse against demonstrators have continued. Between February 2011 and September 2015, the UK has done deals with Bahrain worth £45m, covering arms such as machine guns, assault rifles, and anti-armor ammunition, according to the Campaign Against Arms Trade (CAAT) organization. The total for the three years before the uprising was £6m. The current brutal clampdown followed by a deadlock marked by ongoing anti-regime demonstrations and failure to deal with the forthright Sheikh Isa Qassim and before him, Sheikh Ali Salman shows the attitude of the anti-Iran policy. This is regularly followed by Manama leaders in association with some Gulf Cooperation Council rulers headed by Saudi Arabia to cover up their collective cruelties against the opposition in Bahrain and similarly in Qatif.